Angie Crist was only twelve when she attended her very first air show at Peterson Air Force Base in Colorado Springs, Colorado. But it was an experience that would alter the course of her life. She was transfixed by the sights and sounds, especially the rush of the wind and the roar of the jet engines as the planes swooped by. That was when Angie first heard the exhilarating call to serve her country. A later visit to the nearby Air Force Academy only sealed the deal, and at age 17, she enlisted in the Air Force and spent the next 10 years serving her country. “Joining the Air Force was one of the best decisions I ever made,” Angie says today. “I grew up quickly, became disciplined and developed a work ethic that’s helped me succeed in life.” But it wasn’t just the desire to serve her country that inspired Angie. It was the drive to make a difference in some way, to really have an impact on the lives of others. In a sense, that has always been Angie’s true calling. Serving the needs of others by being of help to them—especially in times of need—is extremely important to this compassionate woman. In many ways, it is the foundation of her life. I came into their homes.” Angie became very close to her home healthcare patients, and on Mother’s Day she would cook and deliver special meals to them. Angie has an equally powerful calling to serve the needs of clients in her role as a real estate professional. She always aspires to provide the highest quality service to them throughout the real estate process. While Angie enjoys working with a wide range of people, she takes particular pride in helping men and women who have devoted their lives to public service. Whether they’re in the military, the medical field, in public education or law enforcement, Angie has made it her personal mission to serve those who serve the community. As both the daughter of an Army officer and a former member of the Air Force, Angie has been through numerous moves throughout her life. She understands all the emotions involved and is dedicated to ensuring that every one of her clients experiences a smooth and stress-free process. To that end, she goes above and beyond the call of duty to ensure that her clients receive the information they need to make the right decisions for their valuable investments. But what Angie’s clients value most is her commitment to outstanding communication and follow-up throughout the process. Angie’s clients know they don’t have to worry about any unexpected surprises, because she’s exceptionally diligent in providing them with the consistent contact they need to anticipate each step of their transaction. 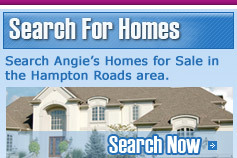 Are you considering the sale or purchase of a home in Hampton Roads? You can count on excellent service from Angie Crist—she has The Call to Serve. Contact her today for a complimentary consultation. 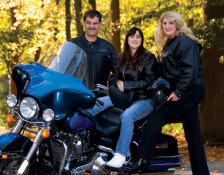 Angie and daughter Brandie usually flip a coin to see who gets to ride first on the back of Walt’s Harley. 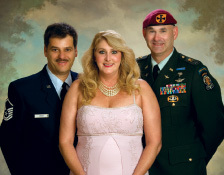 Angie and her husband, Walt, are proud of their Air Force Service and enjoy attending events in uniform with Angie’s brother, Mike, a career Army pilot. 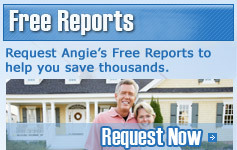 Angie truly enjoys guiding her clients through the real estate process to successful results.